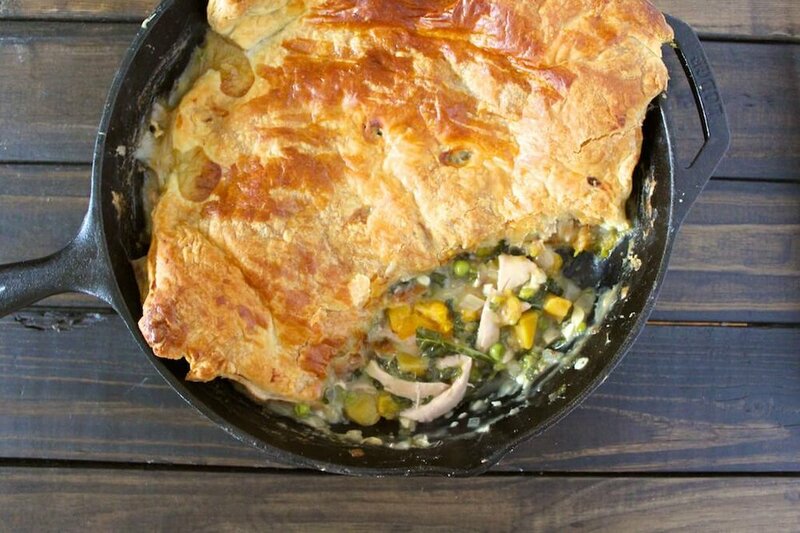 For this cozy chicken pot pie I replaced traditionally used vegetables with butternut squash and kale to make it seasonal. A healthy version of chicken pot pie is just what you need this winter. Butternut squash is a winter squash with a sweet and nutty taste, making this chicken pot pie extra flavorful and the kale gives it the rustic touch. Best of all, you can cut the preparation time in half by use frozen cubed butternut squash and a rotisserie chicken! This chicken pot pie recipe is both easy and tasty! Pre-heat oven to 425 degrees. Sauté the onion in a hot cast iron skillet in olive oil over medium heat, stirring occasionally, about 4 minutes. Reduce heat slightly and add the garlic, stirring until garlic is fragrant, about 2 minutes. Add kale and season with salt and pepper. Cook until wilted. Sprinkle flour over veggies and cook for about 4 minutes, stirring constantly. Stir in broth, 1 cup at a time. Add the squash and peas. Bring to a boil, reduce heat, and simmer until squash is tender or thawed. Broth will continue to thicken. Add chicken to the skillet and stir. Season with salt, pepper and garlic powder to taste. Unfold puff pastry sheet and slightly stretch to fit over skillet, allow corners to hang over the sides. Whisk egg and 1 tsp water in a small bowl and brush pastry with egg wash. Cut 4 slits in top of pie to vent. Bake pot pie until pastry starts to brown, about 15 minutes. Reduces oven temperature to 375 degrees and bake another 15 minutes. Crust will be deep golden brown and crisp. Let cool for 5-10 minutes before serving.